This article is about the bee character in Super Mario Galaxy. For the boss in Donkey Kong Country, see Queen B..
Honey Queen, along with three bees. Honey Queen (known as Queen Bee in Super Mario Galaxy) is the queen of all the Honeybees. She is an extremely large bee and always speaks using nosism. She appears in Super Mario Galaxy and Super Mario Galaxy 2 where she rules over all the Honeybees in the Honeyhive, Honeybloom, and Honeyhop Galaxies, and as a heavyweight unlockable driver in Mario Kart 7. 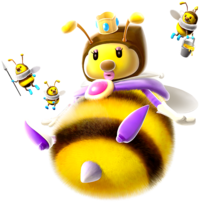 Honey Queen first appears in Super Mario Galaxy, known simply as Queen Bee, where she is a non-playable character. She rules over the Honeyhive Galaxy and helps Mario out in missions there. She first appears in the mission Bee Mario Takes Flight on the Queen Bee Planet where she tells Mario that she is plagued by a terrible itchiness and asks him to stop it. The itchiness is, in reality, caused by five Star Chips that have lodged in the hair on her back. Mario must become Bee Mario with a nearby Bee Mushroom and use his new powers to climb around her back and collect the Star Chips. After collecting all five chips, a Launch Star appears and sends Mario to the final planet and the Power Star. Also, in the second mission Trouble on the Tower, if the player manages to go to the back of the main planet (where the hollow trunk to the slide is located), a Honeybee tells Mario/Luigi that the queen is having a nice rest. Honey Queen reappears in the mission Big Bad Bugaboom at the end of the tunnel with three Mandibugs in it. She tells him that the neighbors are giving them trouble again and asks him to stop them, making a Launch Star appear that launches him to Bugaboom's planet. At the end of the game Honey Queen makes a final small appearance in the end-of-game party celebrating Mario's victory over Bowser along with Dino Piranha and a bunch of Goombas and Toads. In Super Mario Galaxy 2, Honey Queen makes a reappearance in the Honeyhop Galaxy. This time she takes her residence on top of the Queen Bee Planet in the level The Sweetest Silver Stars where she, once again, rules over the Honeybees. When Mario goes onto her planet she tells him that she is plagued by an itchiness and asks him if he could help her out. He, once again, gets a Bee Mushroom and goes on her back to find the cause of the itching to be one of the Silver Stars. After getting all five stars, a Power Star will be formed which he can go get. 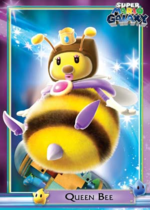 While Honey Queen only appears in one galaxy in the game, she is mentioned by several of her Honeybee minions in the Honeybloom Galaxy in the mission Bumble Beginnings where they are searching for a Power Star to bring back to their queen. Once Mario finds the star, they praise him for finding it while they couldn't. Honey Queen makes her first playable appearance in Mario Kart 7, which also marks her handheld game debut as well as her first appearance in the Mario Kart series. In the game, she is an unlockable character and she seems to be quite smaller than she is in the Super Mario Galaxy installments, being able to drive in a regular-sized kart. Honey Queen is a heavy character, and as a result, she receives one of the best speed and weight boosts in the game. To unlock her, the player must win the 150cc Banana Cup. She also has her own battle course called the Honeybee Hive. Her signature kart is the Bumble V and the Birthday Girl, which along with Princess Peach, Princess Daisy, and Rosalina, gets a color change to match their personal style, which makes her Birthday Girl become purple, as does her Peach Parasol. Her racing symbol consists of a small bee with a crown in the place of its head. Honey Queen and Wiggler are the only playable characters in Mario Kart 7 to not return as playable characters in later installments. In Super Smash Bros. Ultimate, Honey Queen appears as a master spirit. She runs a Dojo where spirits can learn the "Big-Bee Style", which increases defense, jump, and weight, but decreases offense and move speed. Honey Queen also appears in the Super Mario-Kun manga. Her role is the same as in Super Mario Galaxy, although she is very ill.
Honey Queen is a very large bee, over ten times the size of a regular bee, and has a gigantic stinger poking out of the very bottom of her body. On her back she has extremely large wings which reverberate back and forth so quickly they are almost invisible. She has two feet with high heeled shoes on them sticking out of the bottom of her body right above her stinger and two arms with white gloves protruding from her sides. There is always a cape draped over her neck and part of her back which is fastened by a pink jewel right in the middle of her chest. On her head, she wears a brown bonnet which covers her whole head except for her eyes, mouth and nose (the latter of which is purple). She has long eyelashes, black beady eyes with pink eyeshadow, and plump, pink lips. On top of her head, she wears a crown bejeweled with blue gems all around. Whenever she speaks, she does so in the first person plural, a trait commonly associated with royalty. When Queen Bee has a request, it's hard not to oblige. She's quite comfortable in her home in the Honeyhive Galaxy, except for a persistent itch on her back that she just can't seem to scratch. Mario can help when he "powers up" into Bee Mario and crawls around on her back. In the process of helping Queen Bee, Mario finds five Star Chips, which will create a Launch Star that leads him to a Power Star! "This royal bee from the Super Mario Galaxy™ games is large and in charge on the road." "She might look elegant, but don’t let that fool you. This regal racer can hold her own and won’t be easily nudged off track." Guide: "Honey Queen is stepping out of the hive to try her hand at kart racing. She's not looking for trouble, but she has no reason to shy away from it. Honey Queen has all the characteristics of a true heavyweight. She can reach high speeds, but it takes a while to do so." ↑ . Playable characters section on the Mario Kart 7 official European website. Retrieved 21 January 2015. This page was last edited on March 13, 2019, at 18:00.